I think every foodie in Brighton has a local’s spot that they just cannot visit for love nor money. It is usually a place that everyone you know raves about, and for some reason or another you just have never been able to go. You know, it’s that one restaurant that no matter how many times you try to arrange it the universe stands in your way of getting through the door; bad weather, a last minute vegetarian overnight guest, a hangover that will just not allow you to leave your duvet, and the welcome but dreaded words ‘under refurbishment’. 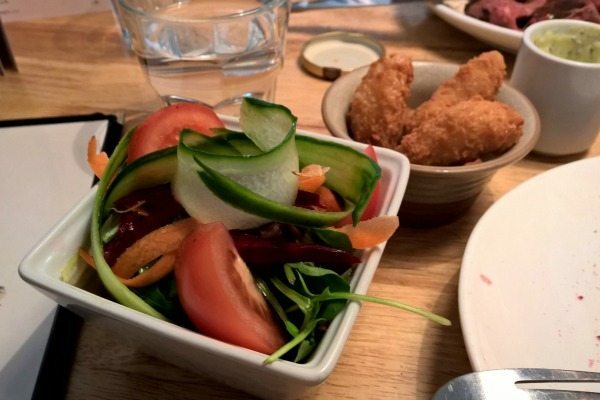 For quite a while I ‘ve had little birdies saying that I absolutely MUST try the steak at the Old Bank, and now I can finally say that I have had the pleasure! I was so eager to finally try this Brighton institution that we were some of the first to arrive. We were greeted whole-heartedly by the friendly host and escorted to our roomy booth. The first thing I noticed was the light in the room, it was bright and full of sunshine coming from their colourfully quaint courtyard. The Old Bank has fairly recently been renovated and you can really see the love they put into it. The decor is subtle and warm with honey coloured wood everywhere and the vinal booth give it a bit of a classic and homey Americana feel, and loved the locals touch with all the artwork paying homage to our exceptionally photogenic city. Our hosts definitely added to that friendly local vibe greeting everyone with a generous smile and a personal touch. In fact we saw several hugs and pleasentries exchanged, even over hearing them ask ‘hows your Mum feeling?’ to one of the regulars. For me this is the height of customer service and creates the type of atmosphere that entices you back time and time again. 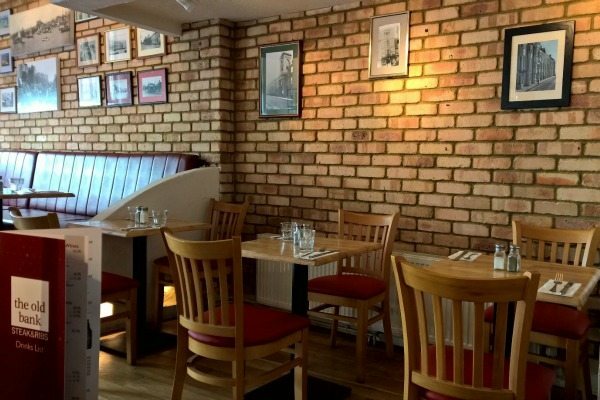 Another favourite home-town touch is their 68oz steak challenge, if you finish your steak it’s free, but if you don’t no worries all the proceed will be donated to a local charity so no matter what you feel like a winner! As it was a Sunday we knew we were headed for the roast, but luckily I had convinced my friend to go ahead and share a starter and a steak with me too. Since the Old Bank is such a classic restaurant I was certain that they would make my old favourites really shine and they did not disappoint, the goats cheese crostini starter was delish. 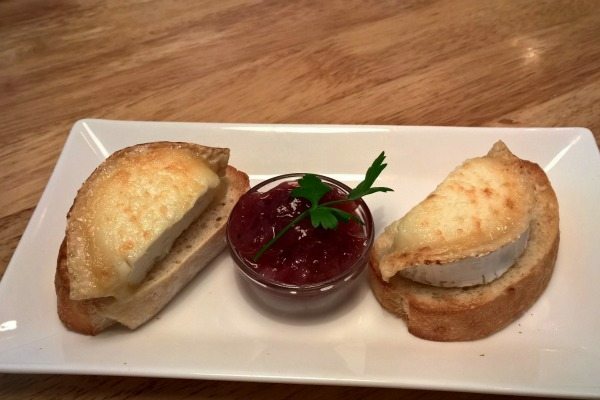 Served on fresh local bread toasted to a golden brown was a thick slice of creamy lightly melted goats cheese with the rind still on giving it an full earthy flavour. It was accompanied by a tangy and sweet home-made onion marmalade that cut through the richness of the cheese and created one of my all time favourite flavour combinations. Next up was the main course, and I can honestly say that I have not had such a generous portion of roast beef in a very long time. Cooked a perfect rare were folds and folds of tender beef that just melted away. The veg was all cooked well, with crispy roast potatoes and parsnips, swede mash topped with mushroom crème, and wilted savoy cabbage that had the right amount of crunch. 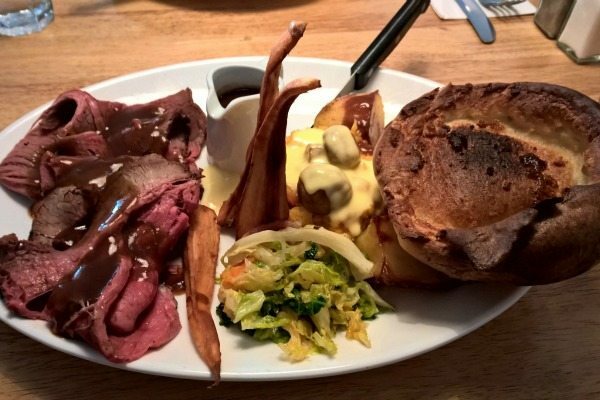 Extra gravy was served on the side, it was rich and tasty, and the dish was topped with a Yorkshire pudding that was huge and pretty much perfect. My plate was piled high and could have easily fed both of us, and I will have to bring my husband back as I know he would love the challenge. 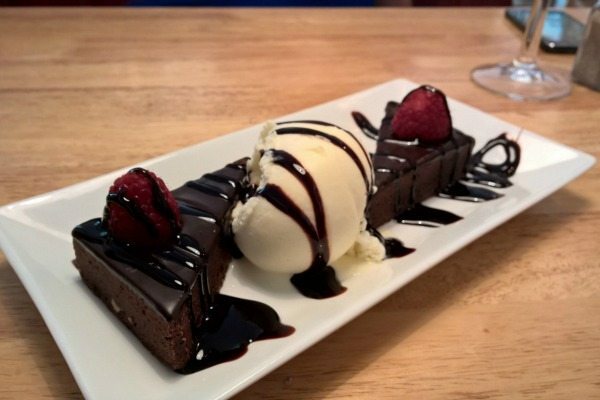 We were ready to throw in the towel after so much fab food, but our hostess insisted on dessert and raved that the brownie was ‘better than Nigellas’ , with this kind of introduction it would be rude not to. Rich chocolate and home-made it was a sweet finish to a lovely meal, and I think Nigella herself would be downright impressed with the service and standard of Kemp town’s Old Bank and I really cannot praise the Old Bank’s staff enough for how welcoming and full of ‘local love’ they are; really top notch. 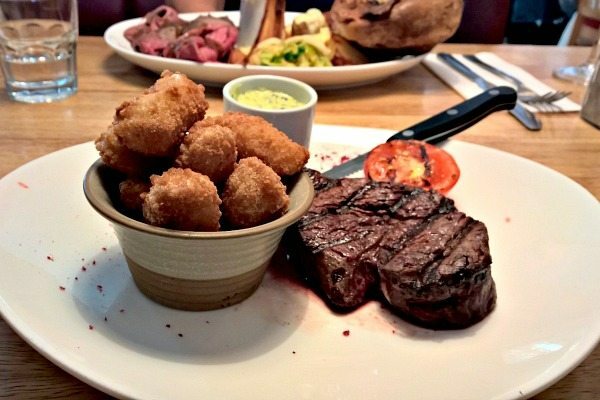 The Old Bank is famous for their 68oz steak challenge, and if you finish your steak is free, but if you don’t no worries all the proceed will be donated to a local charity so no matter what you fell like a winner! The Old Bank is now taking Christmas Party Bookings, and they will be open all over Christmas too so families are welcome to celebrate with them too! 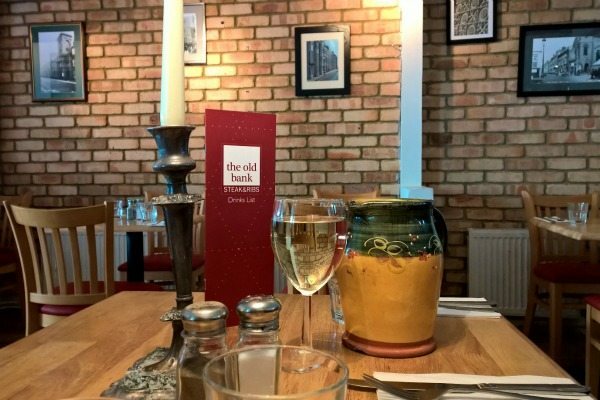 The Old Bank also does wine and steak tasting nights where everyone is welcome to chat about wine with a trained sommelier and of course pair these with their famous flame grilled steaks; sounds like an excellent night to me.